I had to do this. Just. Had. To. Sorry. I will quit soon, I promise. hahahahaha, love it! that’s hilarious. Thanks, Andrea! Yes, that’s one of the things I love most about EC too! And yeah, I chose that picture very deliberately…I think a lot of people imagine EC means holding your baby over a potty a lot, but I find it easier and more fun to just hang out naked outside, at least when the weather’s good (which is most of the time here in Atlanta). 🙂 I’m always trying to explain to people that EC should be fun and laid back and process-oriented, not goal-oriented, and I felt like that picture embodied that well: the picture was about my adorable naked baby playing and having fun, not about pottying. 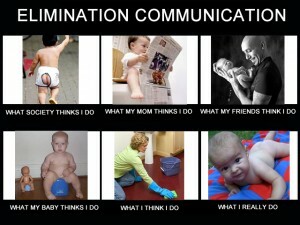 But I think my favorite picture was the “what my baby thinks I do” one. I found that online and just HAD to use it…after I finished cracking up laughing.